It’s been a year almost to the day since I last posted data on the FTSE 100 Cyclically Adjusted PE ratio. It’s therefore worth taking a little more time on this post to spell out how exactly I’m calculating this metric. To my knowledge I am the only person on the internet who is freely making this data available however I have had to make some assumptions to build this dataset. 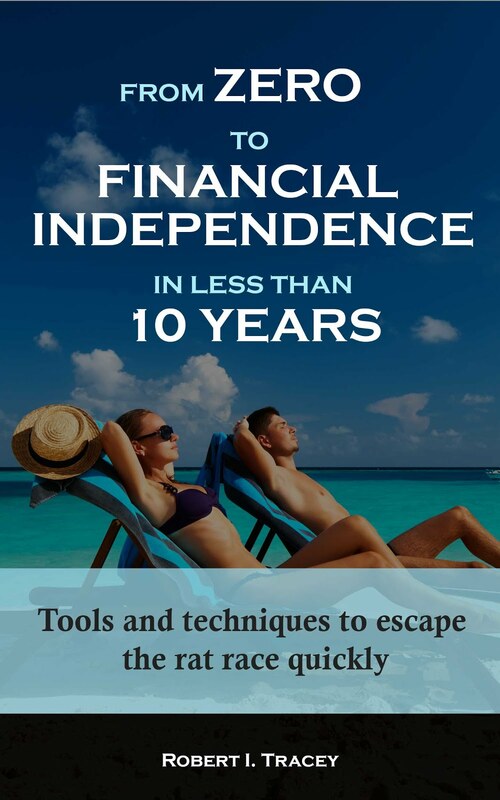 As I write this post the UK stock market is closed. The last trading day was Friday 01 June 2012 at which point the FTSE 100 closed at 5,260. At this price the FTSE Actuaries Share Indices provides us with a FTSE 100 P/E Ratio of 9.4 which allows us to calculate Earnings as 562. These Earnings are as Reported Earnings, which are the last reported year’s earnings and are made up of the sum of the latest two half years earnings. This will differ from a lot of calculated earnings presented online, which will be on an ‘as earned’ (which is the current forecast earnings) basis, resulting in differences, particularly when there are large upward or downward adjustments in earnings. As of Friday the dividend yield has crept up to 4%. The last time we were over 4% was July 2009. If you look back over recent posts you will see that I do not use the P/E ratio to make investment decisions from. This is largely due to the fact that the P/E ratio does not take the business cycle into account. Instead to try and adjust for this cycle I use what I have called the FTSE 100 PE10 (effectively a FTSE 10 cyclically adjusted PE or CAPE for short). The method used is similar to that developed by Professor Robert Shiller for the S&P500. The calculation is the ratio of Real (ie after inflation) FTSE 100 first possible day of the month Prices to 10 Year Real (ie after inflation) first possible day of the month Earnings. The inflation adjuster I use is the CPI. Unfortunately the dataset I have created only goes back to July 1993. Therefore to get a meaningful set of numbers I have had to average in to a PE10 for the first 10 years. 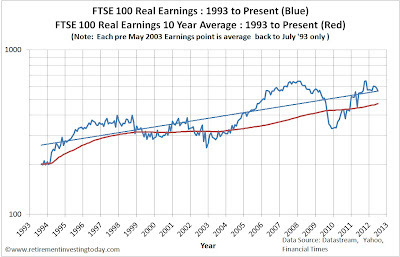 What this means is that July 1994 is actually a PE1, July 1995 is a PE2 and so forth until July 2003 when we have a full FTSE 100 PE10. Dataset Average PE10 = 19.3. Assuming this is “fair value” it indicates that the FTSE 100 is 42% undervalued. I don’t actually believe this and think that this is a function of the fact that the dataset is quite short. More about that later. 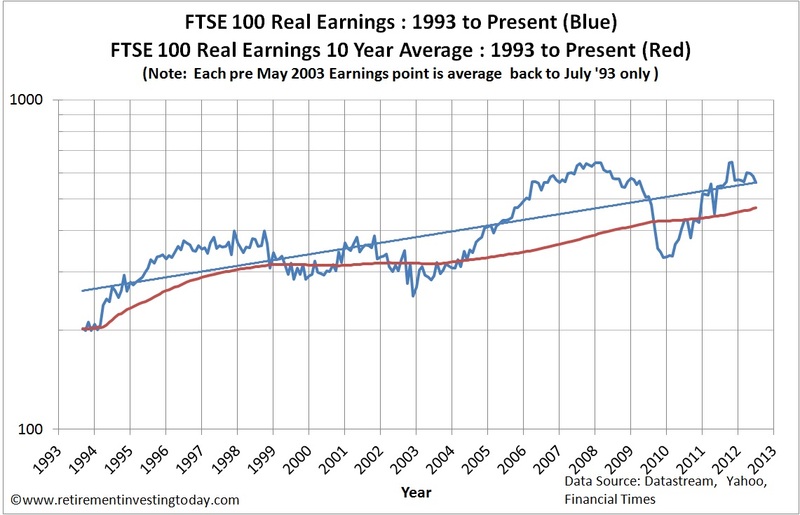 My second chart plots the FTSE 100 Real (inflation adjusted) Earnings. It shows we are quite a way off the October 2011 high of 645 but when comparing to historic Earnings we are still very healthy at 562. 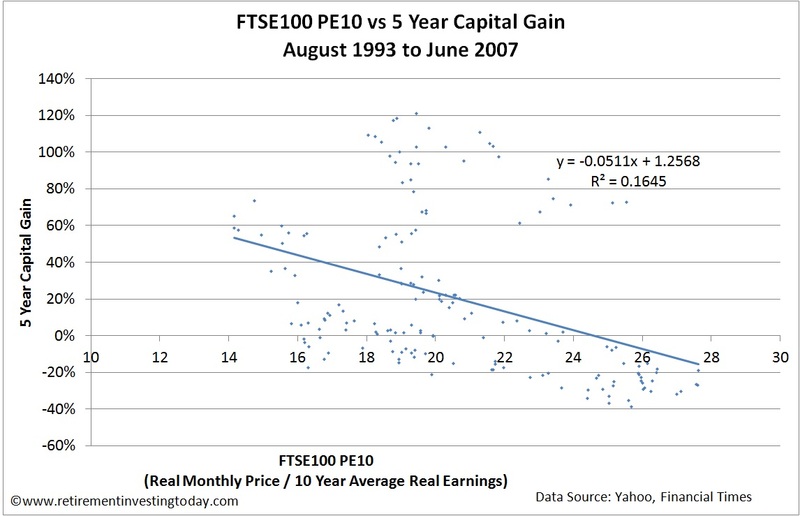 My third chart shows the relationship between the FTSE 100 PE10 and the Nominal 5 Year Capital Gains from August 1993 to June 2007. Ideally this would be a 5 Year Total Return Chart, ie including dividends, however this dataset is not yet mature enough to allow this given my dividend data only goes back to 2006. Even so just looking at 5 Year Capital Gains we see a correlation of -0.48 with an R^2 of 0.16. With the FTSE 100 PE10 at 11.2 the trendline suggests a future Nominal 5 Year Capital Gain of 68%. In contrast the Real (inflation adjusted) 5 Year Capital Gain (not charted today) trendline implies a return of 49%. Finally, unlike when I lasted posted on the FTSE 100, I am now using the FTSE 100 PE10 to make investment decisions from. My problem, as previously mentioned, is that the dataset is quite short. To correct for this I make what some might consider to be a large assumption. 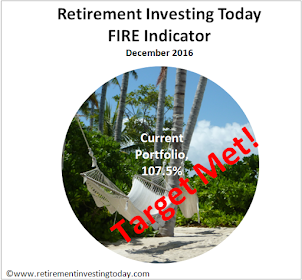 As always I would value Retirement Investing Today readers opinions on this. The assumption is that there is a high level of correlation between UK Equities and International Equities. Tim Hale in his excellent book Smarter Investing shows a table which suggests this correlation could be as high as 0.9. 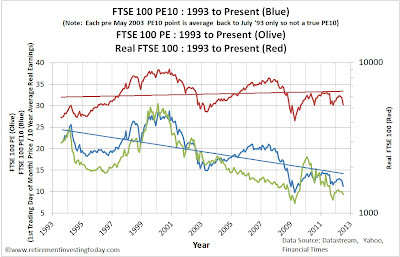 Therefore if I look at my mature S&P 500 dataset it shows that from 1881 to present we have seen an average PE10 of 16.4 and from 1993 to present (the length of my FTSE 100 dataset) we have seen a much higher average PE10 of 26.6. If I ratio these two numbers and multiply by the PE10 Average from my FTSE 100 dataset I can get a pseudo “long run” Historic FTSE 100 PE10. Doing the maths this is (16.4/26.6)x19.3=11.9. Comparing that number with today’s PE10 of 11.2 suggests the market is undervalued by 6% compared with the 42% undervaluation presented earlier. It is that 6% I am basing my own personal investment decisions on. UK CPI inflation data from May and June 2012 are estimated. Another interesting bit of number crunching, RIT. 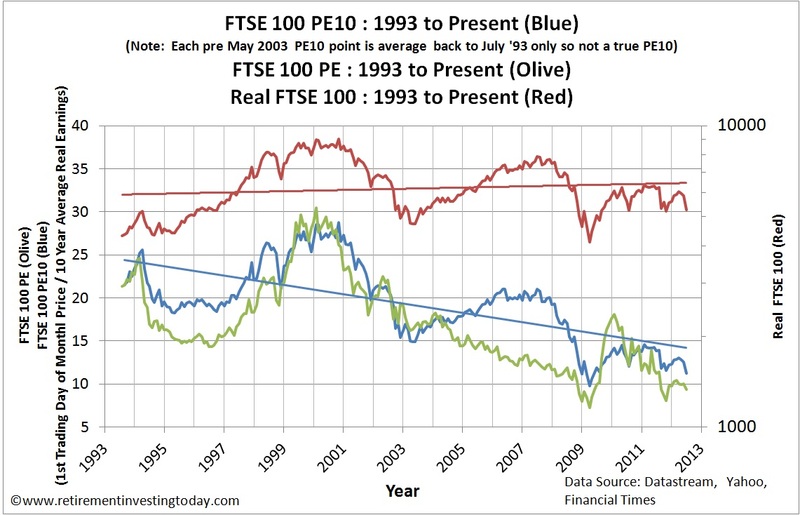 Carrying on from our previous comments, The PE10 trend for the FTSE100, even allowing for the earlier "pseudo" average shows a clear downward trend, echoing the recent part of the S&P500. I guess the strong +ve correlation between US & UK is reasonable and your method for estimating fair value in PE10 terms is the one I would adopt. However, 6% is a rather precise and slender margin. The baby-boomer hump, I suppose, will have its effect, but there are a lot of other things going on that might cause sentiment to shift, not least the yield trend on safe bonds. I find these exercises really interesting, so a big thanks for the work. I don't invest as mechanically as you, but I like to have facts so well presented. I'm glad you agree wth my correlation between US and UK assumption. Agreed "6% is a rather precise and slender margin". It might help though if I define what this means for me in practice as it certainly doesn't mean I'm backing the truck up. Nominally, I aim to hold 20% of my net worth in UK Equities. This small undervaluation forces me to target a hold of 20.4%. So not really a big effect at this time. As I've said in some of my previous posts I'm only trying to squeeze a little extra performance by these tactical shifts to what is essentially a strategic asset allocation. The CAPE information for the FTSE 100 published on this site is to my knowledge the only place online where the data is freely available. I do not know if it is available on any pay for data sites. I also would like to go back a lot further but I have been unable to find any older data and I have certainly spent a lot of time searching. - Many years ago a FTSE100 set of historic P/E ratios were published online which were referenced as coming from Datastream. - All pricing has been taken from Yahoo. I then merge all of these 3 datasets with a little maths to build the UK CAPE you see today and update this information monthly. That is why I reference all three as a data source. As for costs of Datastream? I'm not actually sure but they are part of Thomson Reuters. You may want to contact them. I'm also not sure if Datstream would contain UK CAPE data as it is something that I have specifically created to value UK Equities as I mentined above. The methodology is based on the much more well known Shiller CAPE for US Equities which I also modify to suit my needs and also publish regularly. No, that was helpful and confirmed my findings that it's difficult to find old PE data on the UK market. I cant remember the figures but recall looking into Thomson Reuter services some time ago and being shocked by the costs!